The Sea-Doo X-TEAM sweeps the PRO STOCK podium at the third round of the IJSBA National watercraft racing tour with MACC Racing’s Chris MacClugage claiming another overall win in Racine, Wisconsin on his MONSTER ENERGY/RIVA Racing Sea-Doo RXP-X. Racers aboard the new Sea-Doo RXP-X finished 1-2-3 in the highly competitive Pro Stock class as Snyder Built/Riva Racing Racing backed Troy Snyder and the RIVA Racing/Red Bull RXP-X of Erminio Iantosca filled the second and third spots on the podium behind MacClugage. 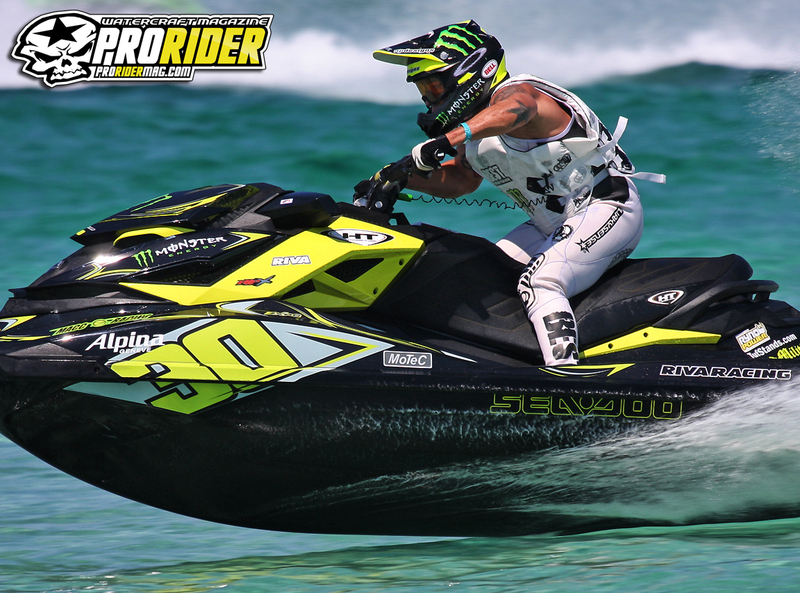 All three racers are utilizing the same Sea-Doo RXP-X watercraft* that musclecraft enthusiasts can purchase directly from an authorized BRP/Sea-Doo watercraft dealer today. MacClugage continues to show how the new RXP-X T3 hull’s tight-turning capabilities allow him to run tighter and faster lap times than ever before. Further proving the off the floor racing capabilities of Sea-Doo watercraft, Georgia’s Jeff Dyckowski and Florida’s Brent Venderley won the Expert Stock and Novice Stock respectively. 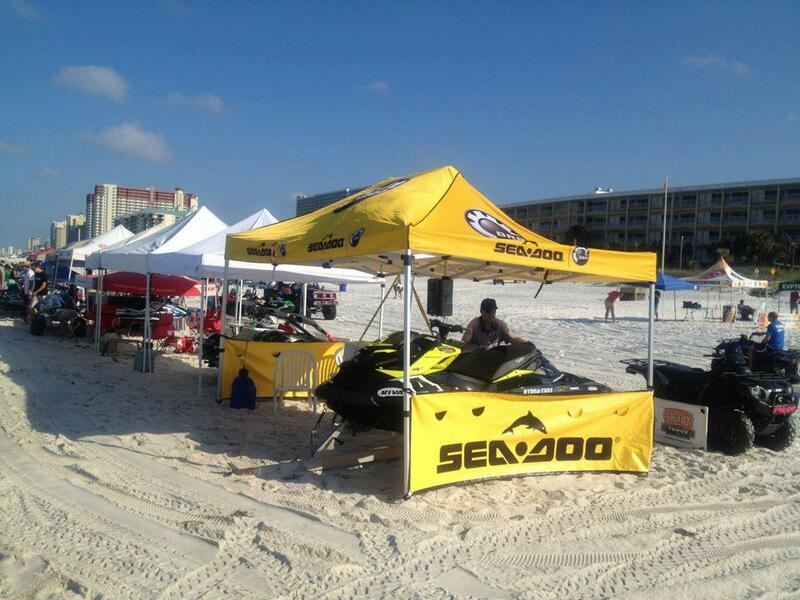 For more information about watercraft racing visit the IJSBA website. Sea-Doo Test Ride Tour—Riders LOVE the On-Water Brakes! The Sea-Doo Life Test Ride Tour is in full swing and we are making our way across the US. During the past two weeks the Test Ride Tour has stopped in Long Beach, Calif., Lake Cumberland, Ky., Atlanta, Ga., and Fort Worth, Texas. Riders are raving about Sea-Doo‘s on-water braking system, acceleration and roominess in our Sea-Doo boats. Check out what riders in Lake Lanier and Lake Cumberland had to say about their Test Rides! The Sea-Doo Life Test Ride Tour is headed to Charlotte, NC at the Pier 49 Marina and Houston, Texas at Clear Lake at the South Shore Marina this weekend…..reserve your Test Ride Tour Stop time today by visiting www.SeaDooDemo.com. Erminio Iantosca is only in the dawn of his 30s but he is a long time veteran of the sport of personal watercraft and chases his passion with the full support of his family. Iantosca has been racing watercraft for over half of his life and has ridden nearly every style and brand of watercraft before making the switch to Sea-Doo last year. 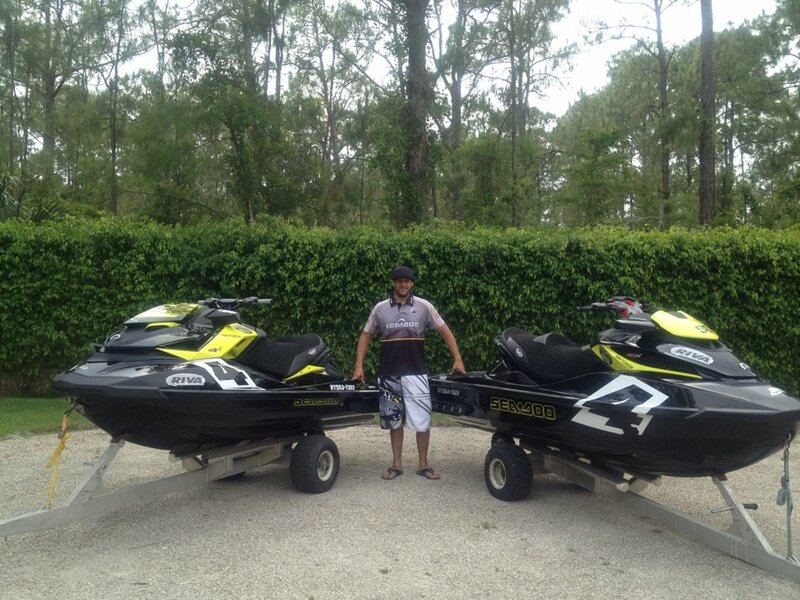 Erminio is well know for running one of the most professional teams among all North American efforts and now flies the Sea-Doo X-TEAM flag proudly. Honing his riding skills on the gulf waters of South-West Florida, Iantosca is a perennial front runner in the PRO STOCK and PRO OPEN classes in a variety of bodies of water but the surf conditions are still his favorite. 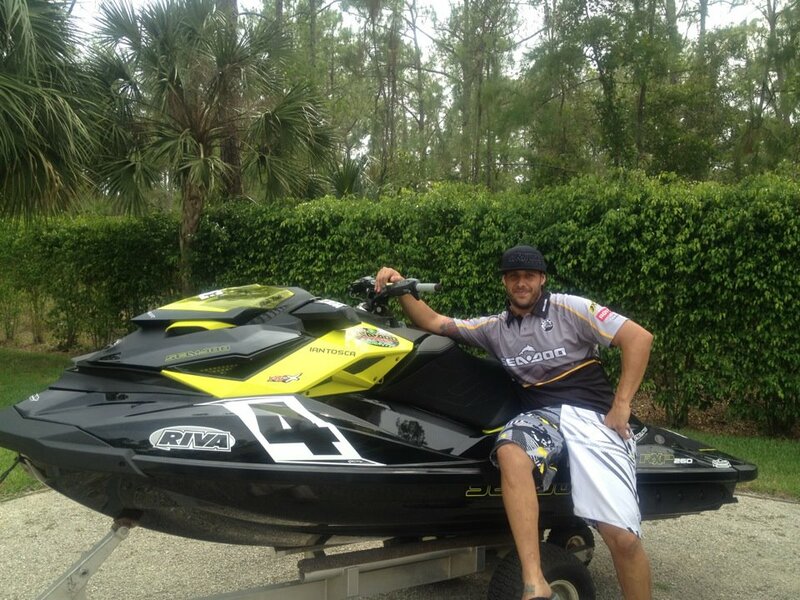 OnBoard caught up with Erminio after the first two rounds of the 2012 IJSBA National Tour to share what makes him tick and how he lives the Sea-Doo Life. ONBOARD —Where did you grow up and how was your competitive spirit developed? I grew up in Naples, Florida just north of the ten thousand island area, so there is a lot of water here. Growing up, my dad always told me “If I was going to do anything, I better do it right,” and that gave me the drive and work ethic to pursue professional racing. ONBOARD — What do you do away from the water to stay on the water? What’s your profession? I try to mix up my athletic training by participating in everything from typical gym workouts to tennis. My family owns Mama Mia’s Pizzeria and my entire family grew up helping with the family business. ONBOARD — How were you introduced to watersports? When I was growing up my Dad got a stand- up (jet-ski) from one of his friends. I was too young to ride it, so he sold it to fellow Sea-Doo X-team racer Chris MacClugage’s dad, for Chris to ride. We knew Chris because my parents started Mama Mia’s Pizza next to a gas station that Chris’s dad owned. Our parents became and still are close friends. As a little kid I would always go to the races with Chris and that’s how I was initially introduced to Watercraft Racing. ONBOARD — Since you began competing what are some of your accolades? Two time Busch World Cup Champion, five time National Champion and one time World Champion. ONBOARD — You have a family engrained in this sport, what are some of your family connections to the sport beyond yourself? Well, besides me as the rider, I am blessed to have an enthusiastic family support system. First, my Dad, who is not only my mechanic, but the hardest working person I know. He is happy to put in endless hours working on my skis to make sure they perform at the highest level. Then there is my brother, Joseph Iantosca, who is my “go-to” guy. He helps with everything from driving and traveling to races, getting the ski to the water, to holding my ski at the start. He also is responsible for filming all of my Go-Pro footage. Last but not least, my Mom and sister are always there for support and to cheer me on at all of the races. I couldn’t have done it all of these years without my mom who has been there through all of the highs and lows of racing. She also keeps us on time and well fed. My sister, Kristina Iantosca-Hodges, my family’s social butterfly, goes tent to tent keeping us updated on the lives of our tight-knit racing community. She is always there at the races to make sure we have everything that we need. Then there is my brother-in-law, Mike Hodges, with Riva Racing who helps me with any parts I need, any questions I may have, and even by being my second mechanic. He is always available to give me positive feedback and keep me focused on the end result. ONBOARD — Your accomplishments riding watercraft have opened the doors for other action opportunities. What “extra” perks have you enjoyed from being a pro racer? Because of the similarities between action sports I’ve been able to travel to amazing locations and meet other extraordinary athletes along the way. Thanks to Sea-Doo, I had the opportunity to teach NFL players how to ride watercraft in the Battle of the Gridiron competition. I had a minor part in a movie titled “Making Waves.” For the past few years, I have been invited to participate in a charity golf tournament benefitting Florida Gulf Coast University’s athletics with a variety of other athletes from various professional sports. ONBOARD — Where is your favorite PWC race site? Oceanside, California has the biggest surf conditions. I prefer to race in big surf conditions because it pushes all of the racers to compete at a higher level. ONBOARD — What is it about PWC racing that keeps you coming back? I enjoy the thrill of going fast on the water, pushing my body to its limits. I also appreciate the camaraderie that we all experience as the PWC racing family. ONBOARD — What is your dream ride? My dream ride would be to take a Sea-Doo watercraft around the islands of Fiji because of the beautiful water and scenic views. ONBOARD — What is or has been YOUR favorite part of being part of the Sea-Doo X-TEAM? 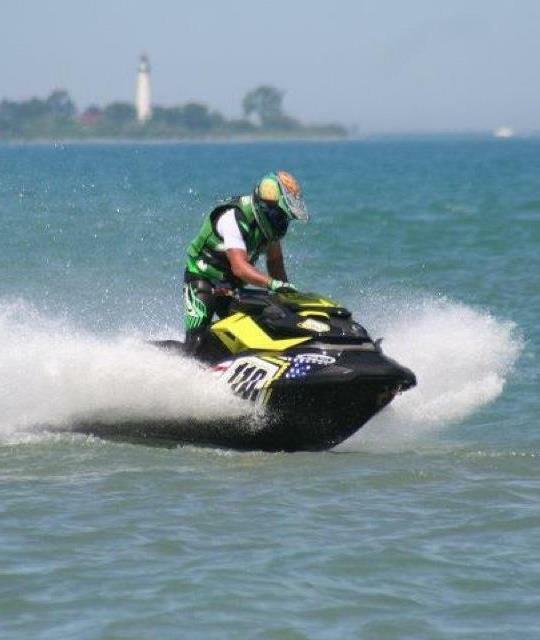 My favorite part of being a Sea-Doo X-team rider is racing for a company as friendly, helpful and intelligent as BRP. ONBOARD — What are you racing right now and what are looking forward to and who is supporting your 2012 efforts? I am currently racing the new Sea-Doo RXP-X, and looking forward to racing to the best of my ability and representing Sea-Doo and BRP to the fullest. This couldn’t be achieved without Riva Racing, WRT, Hydro-turf, Jet Pilot, Craig Construction, Skat-Trak, Spy, DC Shoes, and Redbull. BRP thanks Erminio for his time and passion for the sport. National Safe Boating Week is May 19-25, and we are, and always have been, committed to boater safety. In 2009, BRP received a Boating Safety Award from the United States Coast Guard office of Auxillary and Boating Safety for their commitment to improving boating safety with the introduction of the industry’s first, and only, electronically controlled hand-braking and reverse system, the iBR™ (intelligent Brake and Reverse), on two of its Sea-Doo watercraft models. Sea-Doo remains the only manufacturer to offer this on-water braking system and it is now a standard feature in every 2012 Sea-Doo watercraft category. BRP’s 2012 Sea-Doo boats deliver more versatility, more performance and more standard features which translate into superior value, greater peace-of-mind and a safer boating experience. All Sea-Doo boats are equipped with BRP’s direct drive jet propulsion system which provides numerous benefits over traditional stern drives. They are: direct power for maximum responsiveness, faster time to plane, less draft for shallow water operation, added safety with no exposed sharp objects, and new, optional weedless system on select Sea-Doo models. Don’t forget to Wear it! and wear your PFD (personal floatation device) at all times while enjoying the water. -No matter what activity you have planned – boating, fishing sailing, etc. – always remember to wear a life jacket every time you are on the water. -Make sure your life jacket is U.S. Coast Guard-approved and properly fits. Double check that your life jacket is appropriate for your favorite boating activities. Whether it is during National Safe Boating Week or the rest of the year, you can depend on Sea-Doo watercraft and boats to provide a safe and fun boating experience.